Over the weekend, Lauren and I went to be confused by Inception. It was a pretty good movie, and the first movie in a while where I liked the ending. But the movie wasn’t the best part. I’ve been having a hankering for cotton candy for a while now. It started when my parents came up to visit. We took them to Valentino’s Grand Italian Buffet (that’s a 360 degree panorama, go ahead, take a look). In the past, I’ve considered the buffet most notable for it’s ICEE machine. I can actually consume the price of the buffet in ICEE*, so the buffet is always a bargain. This time, however I noticed that they also have fresh spun Cotton Candy at the buffet (I know, it’s like they read my mind). However, because (a) Lauren discouraged it for some reason and (b) I did not actually notice the Cotton Candy until we’d already been there for quite some time and I was more than full, I did not take any. 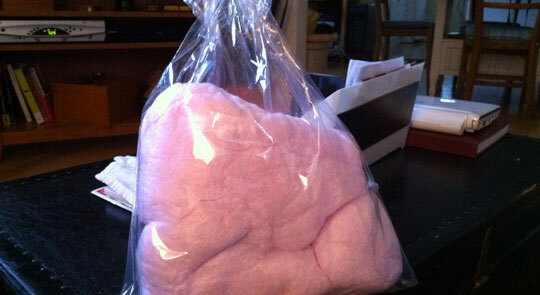 Anyway, since then I’ve been thinking a lot about Cotton Candy and guess what? They have cotton candy at the movie theatre (this is how they spell it so that you can’t actually remember the website address so you can’t actually see what movies are playing). There are many reasons to love cotton candy, but the best one is that, with the proper humidity, it is possible to make it last forever. No matter how often you pull cotton candy in half, you always have the same amount left. My favorite amount to eat at any given moment is that wispy little bit that is roughly the size of a silver dollar, weighs as much as a butterfly and, if smashed, takes up as much room as 2 grains of rice. Sadly, you really can’t keep doing that forever because you inevitably squish some while you pull it apart, and humidity always spoils your fun in the end. If it were not for the humidity, I would insulate our house with Cotton Candy. *Surprisingly enough, this is not a footnote. However, since you’re down here anyway, let me explain. ICEE is actually the singular form, but there is, effectively, no plural form that simply means “more than one” as with most plurals. Instead, two ICEE is denoted as ICEEE, three as ICEEEE and so forth. The asterisk is used to indicate an unknown number of ICEE*. Your post is like the movie “Inception”. I’m mostly confused. But I like cotton candy. And ICEE*. I was going to say the same thing…this post is an ‘Inception’ spinoff. I laughed out loud at the link!! As did my co-worker. Very funny!! I spent a fair amount of time yesterday chuckling as I added link after link that I knew Brad would have to click on. They have cotton candy on the Grand Italian Buffet? How have I not yet discovered this? That’s it--I’m gonna have to plan a visit--soon!